This week, I’m excited to bring you an article from guest blogger Candace Johnson of Change It Up Editing. Those eyes, those eyes, those beautiful eyes! The windows to the soul and all that . . . unless writers unintentionally give them the ability to do things eyes just cannot do. Wandering body parts are usually the result of a writer getting carried away while trying to construct engaging and descriptive prose. I see it frequently while editing fiction, and it’s sooooo easy to do—and is almost always unintentional. You think, How many times can I write “He looked at her longingly” or “She looked around the room”? I gotta mix it up a bit. Eyes falling, dropping, crawling, rolling. Writers love to add a bit of literary color by describing a character’s actions. Most readers will understand what you mean, but too many wandering body parts will have them rolling their own eyes. If you’re writing a paranormal/dystopian/post-apocalyptic story, your character’s eyes might actually leave her head and crawl around the room . . . but that description won’t work for the rest of us. If you make a conscious decision to have body parts participate in action, be sure the action makes sense. Romance novels are filled with descriptions of body parts—like eyes slipping down to cleavage and hands sliding down a back. In this genre, writers take a bit more license with those wandering body parts. But if you’re writing in another genre, consider whether or not your phrasing makes sense. Each of these examples is easily fixed: make sure the action verb relates to the character, not to a part of the character’s body: his hand doesn’t reach for the book—he does. We all know that eyes don’t literally meet, yet that phrase seems okay because it’s so common. But as with other literary conventions like metaphors and similes, writers need to be alert to their own tendencies to overuse clichés. Self-editing is the first way to catch them, and remember to ask your critique partners and beta readers to be on the lookout as well. Dangling Modifiers and . . . Dangling Body Parts? A dangling modifier is a word or phrase that modifies a word not clearly stated in the sentence. When a dangling modifier is combined with a body part instead of an entire character, the results can be hilarious. A seven-foot head, disembodied feet, and an eye in a hurry (with package-laden arms, no less!) certainly provide some interesting mental imagery. As an editor, I would flag this sentence and suggest a revision that describes the giggling and hair action instead of telling the reader about the character’s lips. Beware the temptation to take action away from a character and hand it over to an eye, a hand, or another part of that character’s body as though the character has no control over his or her own parts. Those wandering body parts will haunt you and your writing until you reattach everything in its proper place. Think about Frankenstein’s monster: Created through a combination of alchemy and chemistry, he was a collection of body parts that didn’t work together. Resist the urge to uses pieces of the whole when the entire monster character is the subject of your action, and you’ll avoid those uncomfortable and embarrassing wandering body parts. And if you’re brave enough, feel free to share your most cringeworthy examples in the comments. Candace Johnson is a professional freelance editor, proofreader, writer, ghostwriter, and writing coach who has worked with traditional publishers, self-published authors, and independent book packagers on nonfiction subjects ranging from memoirs to alternative medical treatments to self-help, and on fiction ranging from romance to paranormal. As an editorial specialist, Candace is passionate about offering her clients the opportunity to take their work to the next level. She believes in maintaining an author’s unique voice while helping him or her create and polish every sentence to make it the best it can be. Connect with her on Facebook and Twitter—she loves making new friends. Jen Matera’s not only an editor; she’s also an accountant who has spent sixteen of the last twenty years working in the publishing industry. 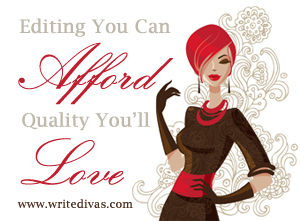 Jen is CFO and a founding Diva for Write Divas and specializes in manuscript evaluation and development, content editing, and copy editing. Jen has worked on books by such authors as: Alexandra Allred, Lissa Bryan, T.M. Franklin, Jennifer Schmidt, M.A. Stacie, and Mary Whitney. Thanks for having me on the blog, Jen! Thanks for the post. Points taken. It’s funny. That’s a problem I see talked about a lot, but it’s one that genuinely doesn’t bother me when I’m reading, unless it’s really bad. If an author says “his eyes followed he across the room,” my reader brain takes that to mean he was watching her, no break in flow or comprehension. Now, “his eyes combed her face” would make me giggle, and I totally see your point. It’s just interesting to me how different our tolerance levels for things can be. I’ve read people saying that “his hand found mine, and our fingers twined together” is completely unacceptable because the hand seems disembodied, but it makes perfect sense to me. My tendency to not mind these things (except in extreme examples like “his eyes caressed her exposed cleavage,” which ruins the mood for me, at the very least!) is why I need beta readers and an editor to catch slip-ups for me. My eyes skim over them, you see. better get my eye on the ball and check my manuscript for possessed body parts, thanks! oh, how I laughed reading this! I once read a book by a very famous author. There was a line, “her legs were endless.” I read that book nearly forty years ago, and I have never forgotten that line. And never read anything else by the author. I keep trying to picture endless legs though. Subscribe to our blog. We promise not to spam you or sell your information to unsavory characters. We’ll even keep our emails to once or twice a week. So what are you waiting for? Follow our blog! Goodreads: A selection of books we have edited. Share book reviews and ratings with Write, and even join a book club on Goodreads.